I really need to start making more of a commitment to post here. I've been so supremely busy writing pre://d.o.mai.n that I seem to have blocked out everything else. But now that I have settled in to a steady pace towards completion of the first novel in my d.o.mai.n series, I realized that I haven't posted anything here in a while, and decided that I wanted to take a few minutes to talk about whats on my mind as I plot out a book series that will stretch 5 books or more (more on that later). There are plenty of discussions and tips online for those of you wanting to read a list of things to keep in mind when writing a series, most of them by authors better qualified to provide you with advice. I'm not going to try to tell you how to keep your series straight. I'm not going to get into the nuts and bolts of outlining or anything like that. I would like to share with you what has been working for me, in the chance that some of it might come in handy for someone that happens across this one day. My d.o.mai.n series is hard science fiction, meaning that it is heavily reliant on realistic scientific advancements- i.e. stuff that can be readily explained. It's pretty much the opposite of fantasy, wherein things can work simply because "It's magic". I love fantasy, but I also like to know how things work. I spend alot of time of sites like Wired.com and Popular Science to learn about things that are being invented now, and that will see the light of day in my lifetime. "Write what you know". It's great advice, and has been repeated for years because it is true. If you want to craft a believable universe, it helps to include factual information to bridge the divide between reality and fiction. Captain Nemo's ship had technology that was fantastical in 20,000 leagues under the Sea, but it was technology that given the vision and resources could have been around at the time. You can't get from A to C without knowing a little bit about where to find B, so to speak. So, in getting back to my series, I started with glimpses into the world and started building from there. I envisioned scenes, then characters to fill those scenes. Then, I connected them in my head with tenuous fibers of plot, building the weak scaffolding that would show the rest of the story where to build upon. 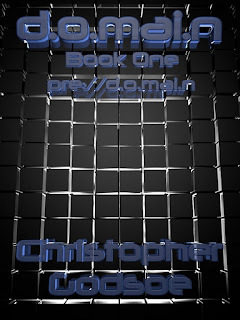 I think I've mentioned that Darknet, the second book in the d.o.mai.n series, stared out as a screenplay. I wrote the screenplay that wasn't really a complete story, and then started to think about what would come after. I wrote the first half of the story, and the ending, but never really closed up the gap in the middle because I had already started dreaming about the sequel. I had no deadline, no one pushing me to complete the story, no one that really believed in the premise enough to give me that little nudge I needed at the time. So I gave up. Life got in the way, and as life changed me, I realized that screenwriting wasn't the right path for me to share my stories. I still had the half finished screenplay, and the beginnings of a sequel, when my mind reached a point where it could once again consider frivolous things. I dusted off that concept in my mind, and the bones for the sequel as well, and realized that the story wasn't two separate tales, but more so a larger tale that I wanted to put my own spin on. The encompassing premise of d.o.mai.n is that of the technological revolution that is coming to our society. It has been handled in bits and pieces by every science fiction author on the planet, but I wanted to combine my vision for how it would all unfold and tell it start to finish. Where will computer technology take us over the next 50 or so years? No one knows for sure, but there are common threads forming in the minds of those authors and dreamers that are want to consider such things. Bradbury, Asimov, and others have laid the foundation, and I agree with all of them partially. I think they all were partially right, when it comes to where our technology might end up, and hopefully I can contribute a small piece of the puzzle as well. That is the true goal of this series, is to introduce a few new ideas to build upon the mountain of reference material that has been given to me by greater minds, and to leave at least a few additions for the next generations. With the plot to one story and a premise to a second, I realized how difficult it was to explain such advances without laying a foundation of my own. Actually, I read Anathem by Neal Stephenson, and really didn't want to write a novel that necessitated a history lesson at the beginning of the book for it to all make sense (though he brought it home masterfully by the end). As I was reading that book (ok, listening to the audio CD-but I drive two hours a day for my day job, it's a great way to consume material), I couldn't help but think, "There has to be a more eloquent way to bring people up to speed." I started with the idea of writing a short story that could do this for me, then realized that a short instruction manual is still an instruction manual, and no one reads an instruction manual. Like any writer, I thought it was pointless to write something that no one would read. That really didn't get me any closer to my goal. It wasn't until I realized that the technology of d.o.mai.n was like the rest of my ideas-built upon the ideas that had come before me. Assuming that today's fans of hard science fiction are alot like me, then they probably have a pretty good idea of what is possible with imagination, a limitless budget, and a Best Buy, so I didn't really need to create a foundation from scratch. I could start with the technology that is possible today (or a year or two down the road), and build from that. I know that if I wrote book 5 in the series first, it wouldn't be nearly as influential as if I wrote the preceding four books. If Tolkien started with Frodo at Mt. Doom, the emotional conclusion of the Lord of the Rings would have fallen flat. So the first invaluable lesson that I can pass on is that of patience. If you are having a hard time conveying what you want to say, give it time, and let the story build up in your mind like ice crystals in a cup of water. If I would have just written the story of book two and released it as I had originally intended, I wouldn't have discovered the great stories that branched off of it in time. If I had started telling the stries in the later books, where the scale has grown to effect everyone in that world, the context would have been lost. I needed to tell the smaller, more intimate story of Miles Torvalds, introduce a few of the larger characters, and give my audience something concrete to hold on to before I touched off the larger, more esoteric stuff to follow. Even this post is difficult to write without giving away the things that I so desperately want to share with everyone. I've been thinking almost exclusively about book five for the last week, and have taken to jotting the ideas down in notebooks and on sheets of paper to clear them from my mind, letting me get back to tell Miles tale. In a way, I've come to realize that leaving the larger, more impressive stories for later will ensure that the sequels improve on the original. I was worried that there wasn't enough story to fill all of those pages, but I shouldn't have. As I am writing this, I have developed a few other ideas that might make it into book five, or might just necessitate a sixth book. I guess I should finish this post then, and get back to writing. My mind is telling stories that my fingers can't type out fast enough, which is a great problem to have.